We commonly use language around people who have a cold and say, “Don’t come near me, I don’t want to CATCH what you have!” Or “So and so GAVE me their cold.” Is this really accurate? Do we really “catch” something? Louis Pasteur didn’t think so. He said the bug, germ, virus, etc… isn’t important, what is critical is the state of the terrain or the body of each individual. Our bodies can only get sick if they are in a weakened state. I believe that most Americans have immune systems and a terrain that isn’t nearly as healthy as it should be. The National Institute of Allergy and Infectious Diseases says that the average child gets 6-10 colds per year. The average adult in the USA suffers from 2-4 per year. But should we suffer from colds or the flu at all? Do natural treatments, remedies or even a cure exist? 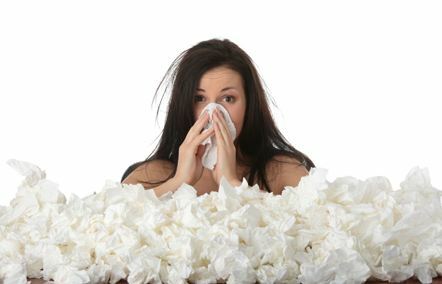 A cold or flu is the body’s way of saying that it needs to cleanse, purge and get rid of toxic junk that we have inside. I believe that they are good things. Exposure to a virus also helps the body to create antibodies so that that virus can’t do the same damage in the future. However, I haven’t had a true cold or flu in over 5 years. I can count about 6 times during the past 5 years that something has tried to get me and my body required back up to help with the weakened state of my terrain. With the right tools during times when the body is fighting something, one can eliminate or minimize the symptoms, severity or duration of a cold or flu. So what can help the body to have a better overall environment that allows someone to not suffer the effects of cold or flus? 1. Reducing toxic exposure. Imagine a catcher at a baseball game trying to catch 3 or 4 balls at the same time. It is impossible for the catcher to get all of the balls. We throw so much toxic garbage at our immune system on a daily basis that it is easy to see how the body gets overwhelmed and eventually it doesn’t have the resources (more than one hand to catch the balls) to be able to property fight against a new invader. What are things that overwhelm the immune system? For starters, toxic chemicals. Our tap water, shower soap, shampoo, conditioner, shaving cream, lotions, deodorant, toothpaste, perfume, etc… are loaded with toxics chemicals. We wage war against our own immune system everyday just by using “normal” everyday healthcare products. Our bodies have to do something with this garbage. This garbage piles up and our filtering systems eventually get clogged. A cold or flu is our body’s way of trying to unclog the system. When the system gets plugged up completely, this is when you get cancer or another chronic degenerative disease. Folks, please love your bodies and take care of them, I beg you. Don’t put things on your body or expose your bodies to toxic chemicals, substances or things that you logically know are not good for your body. The first natural remedy, cure or treatment for a cold or flu is making sure your body is clean and not toxic. 2. Raw materials. The raw materials for our immune system come from the food that we eat. Most Americans eat food that doesn’t contribute to building and maintaining a powerful and strong immune system. Vegetables, fruits, grains, legumes and other plant based foods are what contain the perfect, robust and varied nutrients that our immune systems need to function with power and strength. Eat 6-8 servings of raw or steamed organic veggies and fruits per day for starters. While no cure, treatment or true remedy exists for the cold or flu, eating the right food is one of the first places to start. Just eating small amounts of refined white sugar or high fructose corn syrup per day can lower immune system response by up to 50-75% for 24 hours according to some sources. Sugar is just one thing that brings the immune system from running a full sprint down to crawling on its hands and knees. Everything has sugar in it today…everything…even my organic cereal. Read labels carefully and critically and make sure you know what ALL the ingredients are that are in the box or bag of whatever it is that you are eating. Google the ingredients…educate yourself. 3. Less Stress. High levels of stress combined with eating sugar, just to name two things, is like allowing an army of highly trained soldiers to walk through the opposing army’s camp while they are sleeping at night. It isn’t even a fair fight. Just with sugar and stress combined together, your terrain/body doesn’t stand a chance. If you can’t reduce the stress in your life or the things you have to do, try deep breathing, exercising, meditation, anything that can help you to handle what is going on in your life better. Many more things can help the body have a better chance at defending itself against unwanted invaders that are looking for a new temporary home. However, during an acute attack, what are some of the things you can do to stop a cold or flu dead in its tracks? 1. Mega massive amounts of Vitamin C. Whenever I think a virus or bacteria wants to set up shop inside me, I immediately take 10,000mg of Vitamin C. Folks, taken in large quantities, it acts like the most powerful antiviral we can think of. It is powerful. The idea is to do this immediately when getting that first tickle in your throat. This normally provides the boost that my body needs to take care of the offender. However, sometimes this isn’t enough and I have been known to take 50,000mg of Vitamin C per day. That is a lot of Vitamin C. One myth that floats around out there is that you just pee out all that out. This just isn’t true. Until you reach bowel tolerance (excessive gas, diarrhea), you know that your body is using all of what you are giving it. I will take 3-4,000mg per hour during the day and will maintain this amount until I reach bowel tolerance or my symptoms disappear. A word of caution. Some people are actually allergic to Vitamin C and/or certain forms of vitamin C. So pay attention and listen to your body. You may have to use a buffered form called sodium ascorbate or calcium ascorbate. I normally don’t recommend synthetic products, but in this instance, I keep a 3lb jug of this Vitamin C with Bioflavanoids handy during these acute periods. Check out the literature by Dr. Linus Pauling and Dr. Andrew Saul for more information. 2. Astragalus is a great herb for supporting the immune system. 3. Goldenseal has the ability to be able to directly destroy certain bacteria, virus and parasites and has been known for millennia as a powerful immune system booster. 4. Echinacea is America’s top herb. However, it has gotten a bad rap because so many companies don’t make pure products. Some products don’t even contain 5% of the actual Echinacea. But don’t be fooled, this is indeed a powerful herb to help boost the immune system. I use products I know I can rely on, that are pure, organic and powerful. One herbal product we use has Astragalus, Echinacea and Eleuthero to make one powerful supplement for giving the immune system just what it needs to fight. We also have some other 100% pure herbal products with just Echinacea or Goldenseal. If these products interest you, please contact me for more information as they are only available through health practitioners. Don’t wait until you have the cold or flu to get the backup you need. Always keep great products in your house that you can use during times when you do get a cold or flu. BE PREPARED. 5. Most pathogens are anaerobic, meaning they can’t survive in oxygen rich environments. Learn how to use ozone, hydrogen peroxide and oxygen therapies to oxygenate your body, making it a less inhabitable place for pathogens. Be careful and make sure you know what you are doing with some forms of activated oxygen, as it is powerful stuff. I personally drink ozonated water every morning upon waking and have done this for year. You can pick up a cheap ozonator here. Stick the tube in a glass of purified water for 2-5 minutes and when it is done, drink and enjoy. Many other herbs, homeopathic remedies and other modalities exist that we could discuss here that are powerful immune system boosters. The key is not in a natural cure or treatment, it is keeping the terrain clean and maintaining a strong immune system. Here in the clinic we use other powerful immune system boosting products that we have seen incredible results with. For chronic problems or known lowered immune system response or problems, please contact me as I use very particular supplementation protocols for anything immune related.